I like having the girls in the kitchen with me cooking when I'm not in a hurry trying to get dinner on the table. Making dog biscuits is just like making cookies (actually these are completely edible for humans.) But making them for your dog, the dog gets to eat them instead of having a ton of cookies for your kids to eat (or you!) And believe me, the thought of making a special treat for their puppy and giving it to him was enough of a treat for the girls they weren't even thinking of cookies for themselves! For more pictures of the girls making the cookies check out Ditt & Dott. Mix flour, brown sugar, and lemon zest together in a large bowl. If you are using coconut oil, melt it in a small bowl. Pour into the flour. Then melt the peanut butter in that small bowl. The oil will help the peanut butter slide right out into the flour bowl. Add vanilla and 1/4 cup of the water. Stir with a wooden spoon. Add a bit more water if needed until a ball of dough forms. Roll out and cut into cookie shapes. Bake at 375 for 12 minutes. I can't believe my cooking blog has 39 followers. It is so exciting to see that number grow. Every time I get a comment and every time I get a new follower I get excited. I started this blog mostly as a documentation of the foods I eat and the recipes I made. The joke in my marriage is that I can't cook the same meal twice. And it is true! Everytime I make something I'm always tweaking it or subbing some ingredient or other. A few times my husband would tell me, "This is GREAT just the way it is! Please write it down so you can make it this way again!" Well I never would take the time to write it down and the next time I'd make that dish hubby would sigh and say this is good, but man, last time it was so great! (Of course sometimes the new version really was better!) So I decided one day to finally start writing things down. Then I got a few followers and that was fun. Next I had friends and family tell me that they loved getting recipe ideas from me. I started this blog almost exactly 2 years ago and it is fun to look back at all the fun I've had and how much I've learned with cooking over the past two years. It's neat to see the phases I have been through too. From following a low-calorie/high fiber diet (read here why I no longer believe that is healthy) to being lost about health and just cooking whatever I wanted, from learning how to make homemade breads (here was my first bread!) and now following the principles of the Real Food movement set forth by the Weston A. Price Foundation. I want to let out a big thank you to all of my followers. You all mean a lot to me. Like I said, I love reading your comments and hearing if you've made some version of one of my meals. If I've inspired you to try something new, I love hearing about that too. Even if you tried something and it failed (I've had plenty of failed experiments too!) please take a moment to share with me! If you enjoy reading The Frickin Chicken, I'd love for you to share it with your family and friends. And I did start a Facebook page a bit ago. Please join me on Facebook where the conversation is picking up! If you haven't ever read about how The Frickin Chicken got its name, it's a funny short story and you can read it here. Ever since learning about Lacto-Fermented foods and the nutritional benefits that fermented foods provide, I've been so excited to learn new recipes. Creating lacto-fermented foods is so incredibly easy, the hardest part is to get over the fact that most of us were raised to fear bacteria. For some reason we all know that yogurt is good for us because it has "live-active cultures." Well, I'm learning how to put those "live-active cultures" in ketchup, hot sauce, mayonnaise, pickles, pickled vegetables and more. Those live-active cultures are also known as probiotics and they help keep the flora in our guts in balance. They aide in digestion and they help fight off common colds. I got this recipe from The Nourished Kitchen, where she made her sauce with scotch bonnets. Her hot sauce is just that HOT! I used jalepenos so mine should be called more of a "mild" sauce. I also passed my sauce through a very fine sieve so it is more liquidy than hers. All of this is to your preferences and it is fun to experiment. You are left over with chili paste, that would be great to use in marinades, stir-frys and such. Remember heating anything that you lacto-ferment over 110 degrees kills the good bacterias and enzymes, but sometimes lacto-fermenting is just used as a way of preservation. The chili paste, once fermented will last months in your fridge. Cut off the stems of your chilis and place them in a food processor. Throw in your garlic cloves and pulse until you get a pasty texture. Add the salt, sugar and whey and process a few more times to mix. Transfer to a glass jar and let sit on the counter for 4-5 days until you see some bubble action. Strain using a mesh strainer and you have hot sauce and chili paste! This is not a soaked wheat recipe, I haven't gotten too great at soaked wheat breads yet. I've managed pancakes and the crepes I did the other night were awesome. Even still, making your own bread is usually better than store bought because you know what the ingredients are and they won't include high fructose corn syrup. I based this off of the homemade hotdog bun recipe I made last summer, but I updated the oils to be healthy oils (vegetable oil is NOT a real food, it is a highly processed oil that is not good for you.) I also used whole wheat instead of white flour which means these buns are a bit more dense than the hot dog buns, but you can either half it or use white-wheat. Punch down the dough and make a log. Cut the log into four pieces. Cut each piece into two more pieces. Using your hands, form each piece of dough into a little ball, pinching the dough to the bottom so that the top is very smooth. Let the buns rise for 30-40 minutes covered with a towel. Brush the dough with egg whites. Sprinkle the tops with sesame seeds, if desired. And bake at 400 degrees for 20 minutes. I made little sliders for the girls. I took their dough pieces and divided again so it was half the size of a regular bun. This isn't a very glamorous looking dish I'm afraid. I'm made shrimp stuffed pablano's a while back that were very delicious, but tonight I wanted to try sausage. They came out great too! I wish I had taken a photo of my girls dish, but I forgot. I used a cookie cutter to cut out a heart shape sausage patty and heart shaped bell pepper. I cooked the sausage and bell pepper and stacked them with a bit of cream cheese smeared to hold them together. They ate the sausage and took one tiny bitty bite of the bell pepper... obviously a vegetable that we need to work on around here. Blacken the outside of the pablano peppers. You can do this either by sitting them over the open flame of your stove or under the broiler turning every few minutes. When they are completely blackened remove to a bowl and cover with plastic wrap. Let them steam until they are cool enough to touch. Remove skin (which peels right off) and cut a slit into each pepper. Remove seeds carefully and set aside. Saute breakfast sausage and onion in a small skillet until onion is carmalized and sausage is cooked through. In a medium size bowl, mix grated cheese, cream cheese and heavy cream with a fork. Mash it up to combine, the heavy cream helps mix it together. When the sausage and onions have cooled a bit, add them to the cheese mixture. Stuff each pepper with half of the mixture. Place in a baking dish and bake for 15-20 minutes at 350. You can wrap them in foil to help keep them together or use toothpicks. I didn't bother this time around. Combine everything in a pot and simmer until tomatoes break down and make a nice sauce. I've talked before about why soaking grains, legumes and nuts is good for you. So I wanted to learn how to make soaked wheat crepes. Crepes are excellent recipe for soaking since most recipes tell you to "rest" the batter for awhile anyway. This time you are just "resting" it overnight! These crepes are so tasty and light. I am doing a (mostly) low-carb diet right now, so I actually made this for the girls and my hubby. I did taste a few bites though! I stuffed them with a mixture of grated cheddar cheese, cream cheese, a splash of heavy cream (to help mush the cheeses together) and shredded chicken. They got a thumbs up from the family! Add eggs, salt and melted butter. Stir until well incorporated. I used a crepe pan to make my crepes, but a small non-stick skillet would work also. Very lightly grease your pan with butter and pre-heat it to medium heat. I think the first crepe has to be a throw away, I've never made a pretty first crepe. Using a ladle, scoop out 1/4 cup of batter in the center of your pan. Pick it up off the heat and make a large swirling motion with your wrist. You are trying to make the batter into a large, very thin circle in your pan. When the edges start to curl up a bit, flip it over and cook the other side. It takes about one minute per side for each crepe. I got 16 crepes out of my batter. Swirling the batter around the pan. This dish tasted good, but I learned a lesson today. Cooked spaghetti squash does not freeze well. I had this meal planned out in my head for tonight dinner and the flavors came together except for the squash which didn't taste bad, but it disintegrated into mush. So if you make this dinner, either serve it over noodles, freshly cooked spaghetti squash or even brown rice. And if you make too much spaghetti squash in the future, well... don't freeze it. Saute garlic in a tbsp of butter in a large skillet. Remove to a large bowl before it browns. Add mushrooms and a bit more butter, and them until they are almost browned. Put in your cut asparagus and saute them with the mushrooms. Add salt and pepper. Remove mushrooms and asparagus to the bowl with the garlic. Put your shrimp and more of the butter in the skillet and cook almost all the way through. Again, remove it to the bowl with the vegetables. Put the rest of your butter and cream cheese into the skillet on medium and stir it to help it melt. It will look like a curdled mess. Once it is all mostly melted whisk the arrowroot into 1/2 cup of water. When it has dissolved pour it into the cream cheese and it will magically come together. Add some fresh or dried basil. Pour vegetables and shrimp back into the sauce and simmer until shrimp is all the way cooked through. Serve over noodles, rice or freshly cooked spaghetti squash! Serves about 4. Why in the world would I make spaghetti with liver? Well, liver is a super nutrient dense food. Sign me up! So right now, I've been trying to include a bit of liver in any dish that I make with ground beef. I've used it in chili, spaghetti meat sauce and in meatballs. Liver is a strong flavor that takes getting used to. To me it is sort of an earthy kind of flavor. So for dinner in my house tonight we had a typical meal of Spaghetti with Meat Sauce.... the only difference from a lot of spaghetti's being served up was the addition of liver! It's been another busy week so far, and it's only Tuesday! I guess spring is that time of the year where things get crazy. Today I had a St. Patrick's day party planned for my twins' playgroup and I was trying to think of what to serve the moms for lunch. We typically do a "mom" lunch and a kids "lunch" even though I really think that the kids should be eating what we eat. Most days that's what my girls do. I decided to make these Chicken Cheddar Hoagies, a dish I made the first time almost two years ago. I think I've only made them once or twice since then even though they are really quick and super tasty! Back then I was on Weight Watchers so I put a scant amount of low-fat cheddar cheese on each one and I sprayed my pan with a tiny amount of cooking spray. Now I follow the Real Food movement and I've learned that fats such as lard, coconut oil, olive oil, butter and other traditional fats are actually good for you. So this dish went through a bit of a revision. (Which is so funny since I used to take full fat meals and make them low-fat for Weight Watchers!) These days recipes still go through revisions. I don't cook with fake fats like margarine, canola or vegetable oils. I don't buy products that have MSG or any "natural flavors" listed. I've learned that "natural flavors" is not the same thing as REAL food, and that "natural" usually means some derivative of MSG. The Chicken Cheddar Hoagies seemed to be a hit with my friends and they were a hit with my girls too. I've never seen them down onions and bell peppers without inspecting them and whining a bunch. If you are looking for a good fast meal to put together, give this recipe a try! This post was linked at Kelly the Kitchen Kops website. Here was an easy dish to throw together. I served it with a modified version of THIS broccoli salad. I used homemade mayo. And for this time around I used half the amount of mayo and the rest pure bacon drippings. I also switched out the refined white sugar for backstrap molasses. I served a homemade ranch dressing on top of the chicken. Cut chicken breast almost in half and stuff with the cheddar cheese. Pat dry and sprinkle salt and pepper on top. Wrap two slices of bacon around each chicken breast. Bake on a rack at 375 until chicken is all the way cooked through. You may need to broil the bacon a bit at the very end to crisp it up further. I think for the first several years of our marriage I rarely cooked the same meal twice. I was always fiddling and adding or coming up with something completely new. Well now, I've finally come to a point where I do recycle meal ideas (I mean, we have been married 8 years!) But I still tweak away. I figured occasionally I'll do a post called "What's for Dinner at My House." That way I can show you some of the tweaks I may make to recipes. For instance tonight I served homemade chicken nuggets, homemade fermented ketchup (full of probiotics! ), sweet potatoes, and asparagus; bacon. I thought it was funny when I kept encouraging my kids to "eat their ketchup!" Dinner around here isn't always fancy, sometimes it's just whatever happens to be in the fridge; but eating Real Food doesn't have to be fancy or complicated. Usually simple is better, the flavor of real, fresh ingredients shines through. I added this post to the Healthy Home Economist Monday Mania Blog Carnival. 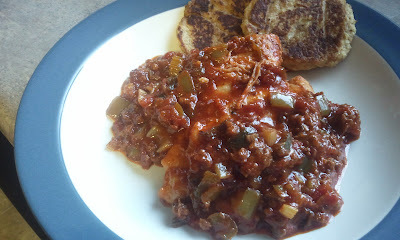 Tonight for dinner I made a wonderful braised pork dish and when I was thinking of side dishes these potato pancakes came to mind. They are crispy on the outside and soft on the inside. And while these don't exactly fit into my low-carb diet right now, my family enjoyed them. And they are fried in (non-homogenized) lard, which contrary to popular belief is actually good for you! Cube Idaho potato and place it in a small pot. Just barely cover with water and bring to a boil. When it is very fork tender, drain all the water away.Meanwhile, grate sweet potato in a large bowl. Sprinkle apple cider vinegar over top to prevent browning. When Idaho potato is done, either use a ricer, a food mill or a mesh colander to push the potato through for a very fine mashed potato. Add it to the sweet potato and mix thoroughly. Crack two eggs in the bowl and sprinkle with flour or arrowroot powder. Mix everything together. Bring lard up to a frying temperature and form small 3 inch pancakes in a skillet. Drain on a paper towel. This is a very intensely flavored dish. I tried to make cauliflower and cheese pancakes to serve along side but they didn't turn out that great. In a large heavy bottom skillet, melt the coconut oil. Brown two chicken breasts on both sides and remove from skillet. Remove the casings off chirizo sausage and brown in the skillet, breaking up the sausage as it cooks. Dice bell pepper into small squares and put it in the skillet with the cooking chirizo. Next add diced pablano pepper and celery. Cook a few minutes until vegetables start to get tender. Sprinkle over the arrowroot and then add chicken and beef broth. Stir to incorporate all ingredients. Add the roasted tomatoes. The skillet will be very liquid-y. Turn your burner on high and let it come to a hard boil. Stir every five minutes or so to make sure it isn't sticking. Cook until it has thickened and reduced by half. About 20 minutes. Bring back down to a simmer and add chicken. Cook an additional 20 minutes until chicken is cooked through. Serve with avocado slices or sour cream.